Welcome to a brand new series of blog articles. I’ve been working on this project for some time and it’s part of a much larger venture for me. This has been years in the making and represents an important first step. It’s my hope that both new and long-time readers of my blog will like the eventual results. My idea is to take all of my knowledge, years of experience and a love of helping others and channel it into a series of “tips” to help improve your photography with articles here on the blog and videos over on my YouTube channel. I’m confident I’ve hit on a combination that will really help people at every skill level from newcomers to pros and everyone in between. The question you might be asking yourself is: “Why is Monico choosing to go in this direction?”. The answer is simple – formal education in a subject is awesome, but nothing helps faster than a tip. Not every tip is right for everyone – but most of the time even a small tip can make a pretty big difference. And what I love is that a tip can be anything from a place to shoot, a setting for your camera, a lens recommendation and even a useful piece of gear. Years of being out shooting is a great way to learn and I believe there’s no substitute for “real world” experiences. For example – I’ve watched videos and read books about Paris – but neither are the same as standing below the Pont d’ léna in Paris and looking at the Eiffel Tower with your camera and knowing that you only have so much time to get a shot. The bottom line is: You really need to travel if you’re going to become a better travel photographer. But what if someone could give you a tip to help you save time and increase the chances of getting a great shot in less time. For pros a good tip (like a cool location) can be a huge time saver – and that gives them more time go get more good shots. For newcomers a good tip can really lower your stress level if it eliminates a little struggling. I love great photography tips! By sharing some quick tips about my gear, how I shoot or what I do when editing I believe I can get more useful information out faster than putting together really detailed articles to explore a technique. I’ll still put together longer articles from time to time – along with detailed gear reviews – but I think having a series of quick tips can really help fill in the blanks for those bigger posts and gear reviews. Being successful as a photographer involves three things: knowledge, creativity and gear (as well as a little luck from time to time). Knowledge (and experience) is what informs your decisions like camera settings and composition. Creativity is what you use to develop your unique style. Your gear is the collection of tools you use to take an idea and turn it into a final product. Every professional I know uses their knowledge, creativity and gear to develop a workflow that ensures repeatable success. The gear you use matters. Think about a wood-worker for just a moment. Every wood worker I know (and I know plenty) has a lot of tools. Why so many tools? Because each tool does something different. A saw can cut wood, for example, but it’s the wrong tool for making something feel smooth to the touch. For a photographer a 50mm lens might be a great street photography lens, but it may not be wide enough to capture sweeping landscape shots. This is why I think of the many pieces of gear in my photo bags as tools – each one there to do a specific function. It’s important to note here – some gear can be extremely expensive. Professional results usually require professional gear. But some gear can be extremely inexpensive, but equally important. Sometimes the inexpensive gear can used to make sure the more expensive gear works at it’s maximum potential. Today’s Gear Tip is an inexpensive tool I always have in my photography bag that can solve a problems most photographers have faced. There are more spots in the shot from dust on the sensor, but the above shot should show you what happens when dust accumulates on a sensor. You can use a $10,000 medium format camera – but if there is dust on that sensor the final image will look terrible (or require some serious time in Photoshop to fix). Unfortunately dust spots are often difficult to see in your camera viewfinder or on the LCD. I’ve gone on photo walks and not realized there was dust on my sensor until I got home and looked the images on my computer screen. Talk about disappointing! Luckily a solution exists to fix this problem for well under $20. An air blower, like my Giottos Rocket Blower, can quickly remove dust without the potential for damaging your delicate camera. The idea is simple – when you remove a lens you place the tip of the air blower just inside the camera opening and you squeeze the blower. This expels air from the blower into your camera to dislodge any dust that might have found it’s way inside. I like to hold my camera with the opening facing down when I do this (so any dust falls out instead of being blown upward – where it can re-settle inside the camera). One reason I prefer blowers like the Giottos has to do with it’s design. 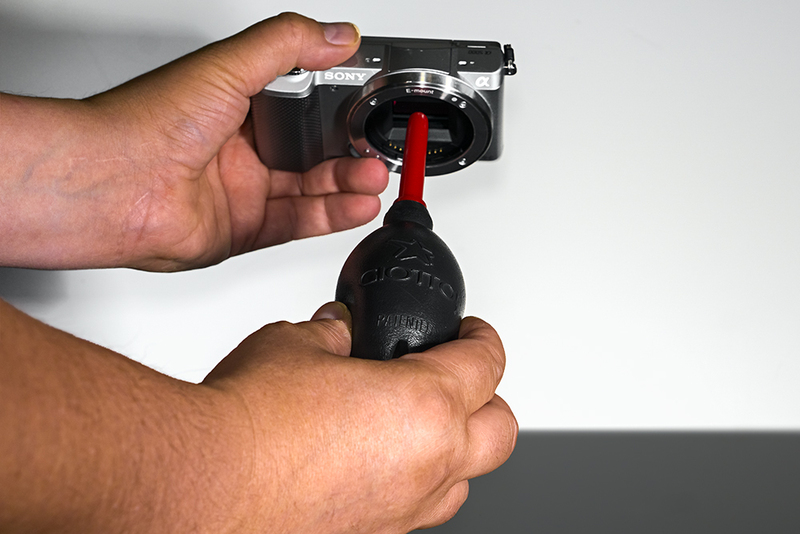 Instead of pulling air in through the nozzle (potentially drawing dust into your camera), air is brought in to the bulb through a valve on the bottom. This design ensures only clean air in allowing you make multiple squeezes without removing the blower from inside your camera. This design really makes a difference. IMPORTANT: using air is a great way to remove dust but under no circumstances should you ever use a can of compressed air!!! Cans of compressed air use chemicals to expel air and, while it’s OK for cleaning keyboards, it should never be used on delicate electronics. The cold temperature of compressed air, and the fluid that usually comes out when you use it, will make things worse. In fact – using cans of compressed air can seriously damage your camera! There are plenty of good quality hand air blowers on the market but I’ve always used the Giottos brand. I own several – in numerous sizes – and I always try to keep one with me (my small blower is almost always with me). Another extremely nice air blower is made by VisibleDust (it adds in air filters to really make sure the air is as clean as can be). The first time I watched a professional portrait photographer shooting an executive at Ford Design he had a $40,000 camera rig and tens of thousands of dollars in ultra high-end lighting gear – but one of his assistants used a $30 VisibleDust hand blower on his Hasselblad camera sensor before attaching a lens. I never forgot that moment and I bought my first hand blower the next day. Hopefully this gear tip helps you to eliminate those annoying dust spots from your shots. Speaking of help – you can support me (which will help me to share more tips like this) by using my links to buy your gear – including your next air blower. Using my links won’t cost you any more – but I receive a small percentage that helps me cover the expenses of maintaining this blog, as well as producing new videos. This entry was posted in gear tips by Monico. Bookmark the permalink.